Hollywood beauty for two decades. Hair, Makeovers, Reality TV Shows and more. Celebrity Hair guru Billy Lowe has seen it all. You don't need to spend an hour blow-drying your hair. Believe it or not, it can be much easier than you think. But having the right products and the right styling tools can definitely be helpful. I'd say I have "some" experience with holding a hair dryer - and somehow managing to handle clips, brushes, combs, hair, and chat with the client all at the same time. Oh, did I mention keeping my balance? So here's the skinny on fabulous hair. Start with your favorite shampoo and conditioner. Don't overdo the conditioner or it may leave you with limp/lifeless hair. And be careful not to overuse conditioning oil treatments. Hair needs to breathe you know. After cleansing hair, apply a light-weight leave in hydrator/detangler and brush through using a large paddle brush. 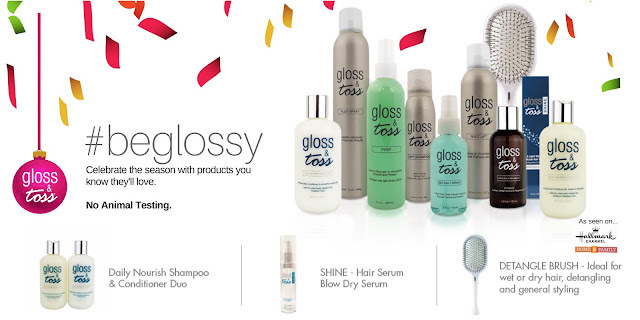 Use Gloss & Toss hair shine serum by Billy Lowe - for ultimate polish and shine. It only takes a little of this miracle formula. Start applying mid-shaft through to the ends and distribute evenly using a large paddle brush. Blow-dry hair until it is 80-90% dry. Hair doesn't take shape until it is at least that dry. I always start at the roots and make sure they are dry first. Using a large round brush (metal or ceramic are my preferences) blow-dry hair in larger sections (since hair is almost dry anyway) keeping good tension on the hair as needed and keeping brush/dryer moving. Never "park" the hair dryer onto the hair nor leave dryer pointed in one spot. Always keep it moving. Once dried, apply GLOSS & TOSS hair shine serum through to the ends as needed for final shine or control of hair. I generally start in the front when blow-drying hair. This is good to do on your own especially if you are in a rush. The back can always air-dry on its own if you run out of time in your styling. Look for GLOSS & TOSS this season for ultimate polish and shine. Truly the ultimate hair shine serum. ??? Celebrity hair stylist Billy Lowe will be interviewing a very special guest this coming week. Stay tuned to LoweLights.com to find out who it will be, and how you can be more beautiful than ever with her super amazing tips. We look forward to bringing you our first real interview this coming week so stay tuned. This and a lot more are happening in 2011! The Georgia Boy Choir - Think On Me The romantic letter Think On Me written by Mary Queen of Scots. This song has been sung year after year in countless vocal performances and competitions throughout the years. I remember as a little boy I competed in boys' classical piano events winning regionally and ranking 3rd and 4th in the state of Georgia at 15 and 17 years of age. Think On Me is the ultimate piece that we all longed to hear year after year and it's been one of my favorite pieces for many years. My friend Bonnie Mancil performed this as a solo one year for literary events and I've heard different performances and variations. Never, until now, have I been so moved, so stilled, and so in awes of the purity of this performance and I hope you will fall in love with the melody as much as I have loved it for over 30 years.